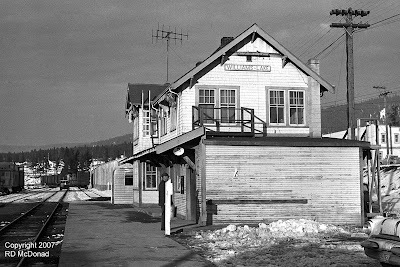 Williams Lake B.C., November 1959. Managed to shoot some locomotives here when the northbound freight stopped to set off a string of cars. I recall it was about 20 degrees (f) and little time was spent exploring, family patiently (?) waiting for me in the car. Pacific Great Eastern began as the Howe Sound and Northern, later renamed Pacific Great Eastern after the BC Government took over operation. 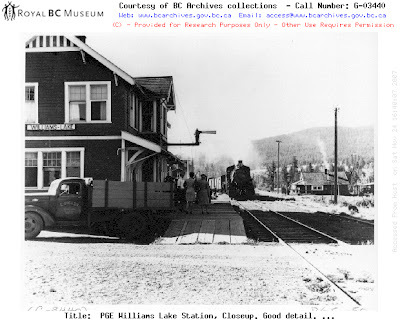 Working north through the Cariboo County of Central BC, steel finally arrived at Williams Lake in 1919. Built as a “Standard #3 Station” it was completed in 1919-20. The station now contains an art gallery! You know, it’s easy to roll off important dates when things change. As an example, BC Rail gave way to privatization on 0001 hours, July 15, 2004 when Canadian National became the operator. That’s the easy part. What about the locomotives, do you repaint them or let them reach their “natural” passing? What about the people? Well I found a document that sheds some light on such a complex turnover. 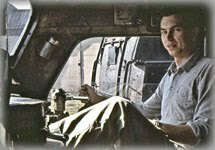 Scroll down to Section 13 "Training and Piloting." I remember the mess after the Great BN Merger, with locomotives running around with stenciled numbers on the cabs! Williams Lake. Then and Now.